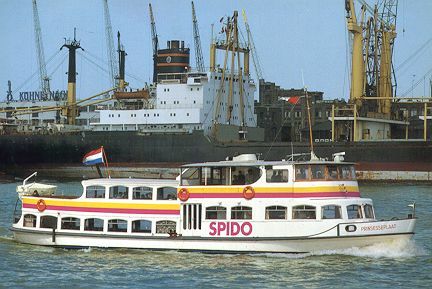 This page is devoted to postcards and photographs of the Rotterdam excursion ship operator Spido. An alphabetical list of ships illustrated on this page is shown below. Below this is a fleet list showing postcards & photographs in chronological order. 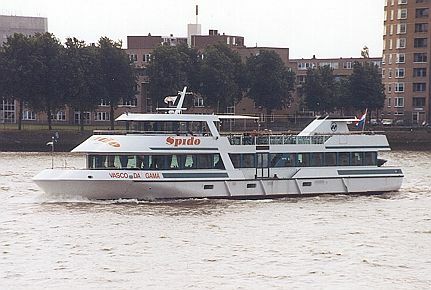 Spido are the main excursion ship operator in Rotterdam. 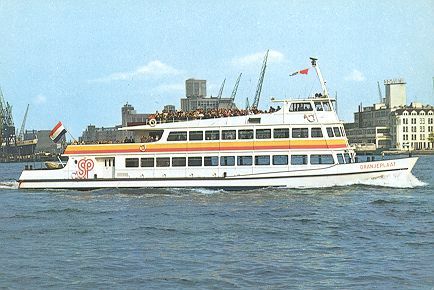 I have no details on the early history of the company, but they were bought by famous towage company Smit in 1976. 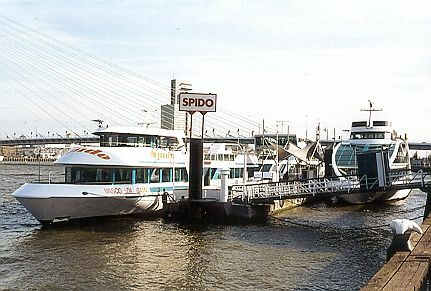 Initially, Spido did more in the Port of Rotterdam than just sightseeing trips. 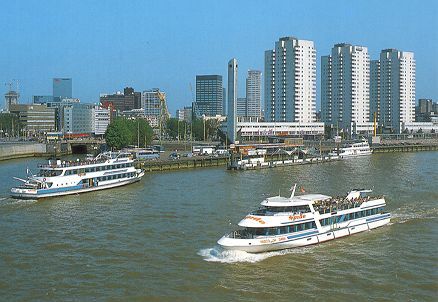 At least until the fifties they delivered mail to ships in Rotterdam (with an official contract from the Post Office) and they also acted as taxi-ships, collecting sailors from, and delivering them to, ships in port. 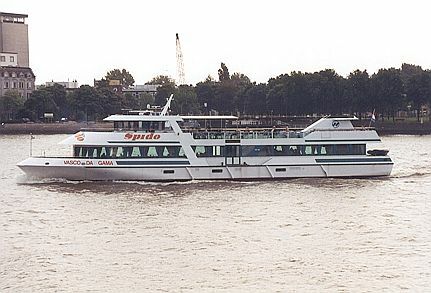 Flying the "E" (locally known as the "Spido-flag") was all that was necessary to get a boat alongside. 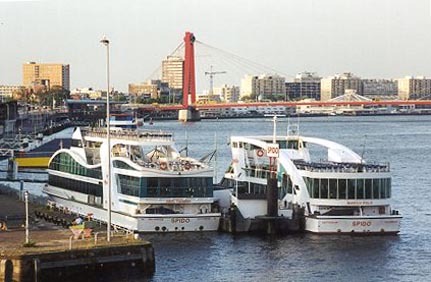 The current fleet consists of three vessels, Abel Tasman, Marco Polo & Vasco da Gama, which operate short harbour trips of 75minutes, plus longer excursions from a terminal by the Erasmus Bridge in the centre of Rotterdam. 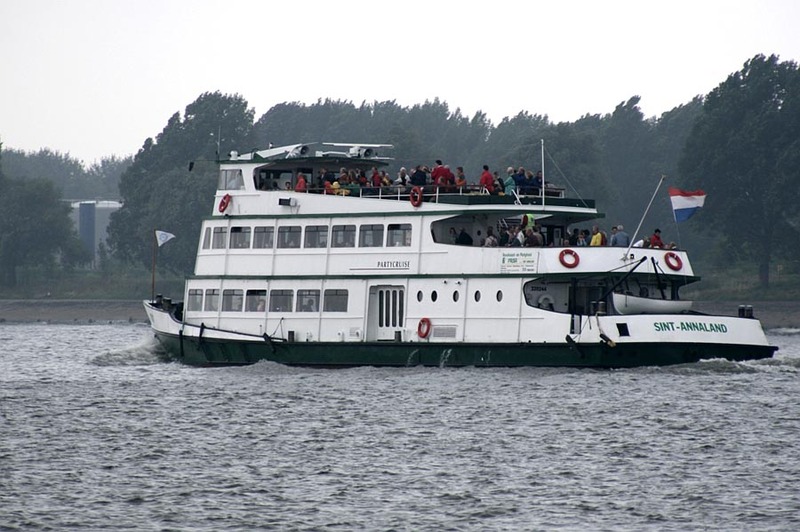 When I visited in May, the short harbour trips were leaving on a 30 minute frequency (this reduces in the summer when more of the longer trips are run). 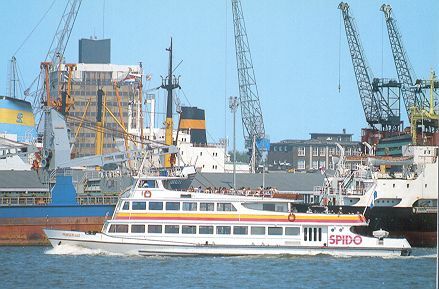 This schedule required three ships to maintain it, but the newest vessel Abel Tasman was on a charter, so Spido were using the Aqua-Fun, previously their own Stad Rotterdam of 1962, but sold in 1999. 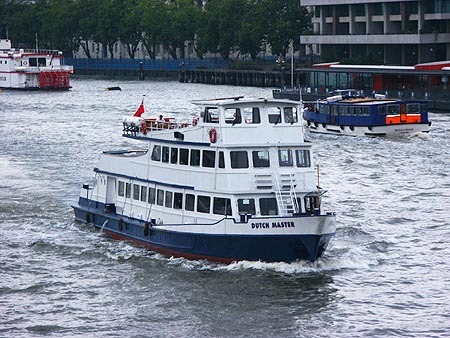 In May 2003 I have added pictures of Dutch Master (ex-Prinseplaat) now working as a charter ship on the Thames in London. Regentesseplaat - Fleet member 195?-19?? 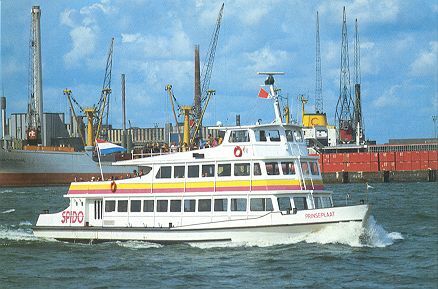 Vasco da Gama - Fleet member 1998-200? 1937 - New engines (Original Kromhout engines exchanged for Werkspoor). 1940 - Scuttled in front of Enkhuizen harbour, raised soon after capitulation. 1941 - Seized by the Germans, renamed "Wilkommen". 1943 - Sent to Antwerp for rebuilding as troopship. 1944 - Rebuilt as "Navigations Schulschiff" (training-vessel) "Regulus"
1945 - Used to evacuate Eastern Prussia and other "Ostgebiete" as the eastern front collapsed. Recovered, badly damaged, at Wangerooge and towed back to Amsterdam. 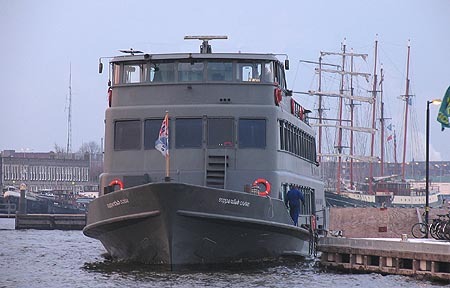 Restored and refurbished by "NV Nederlandsche Scheepsbouwmij", Amsterdam. Back in service between Enkhuizen and Stavoren. 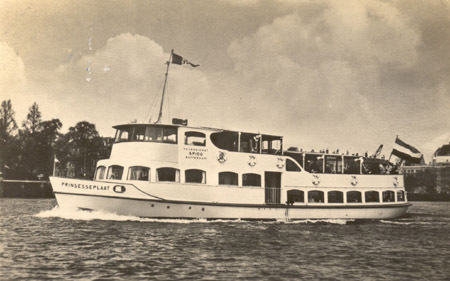 1947 - Withdrawn from service, used for Northsea-excursions. 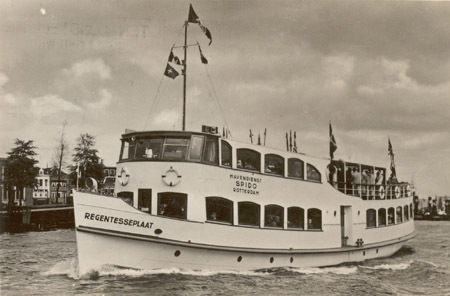 1954 - Test-runs between Den Helder and the island of Texel for TESO. 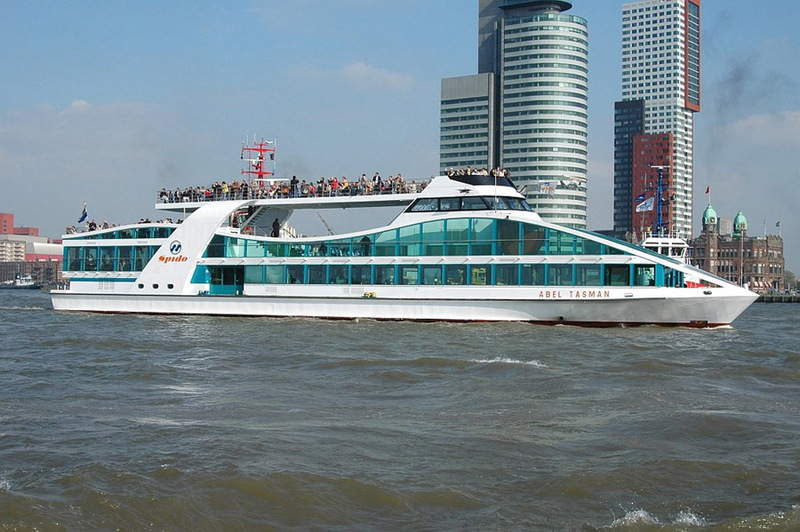 No sale; price of the vessel, combined with the cost of conversion to a car-ferry too high. 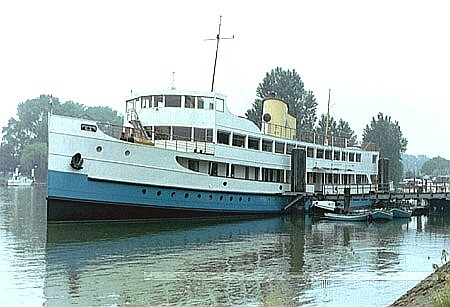 1955 - Sold to "Spido", conversion to excursion vessel by Wilton Fijenoord. 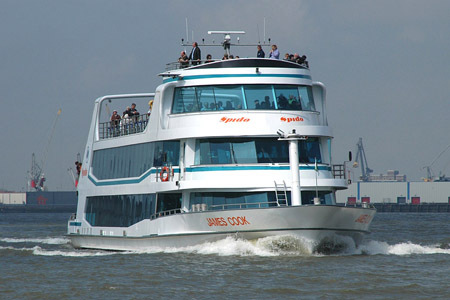 Renamed "Erasmus", used for sight-seeing trips in the port of Rotterdam. 1956 - Reconstruction of bridge. Wooden bridge replaced by steel one. 1973 - Inactive, laid up. 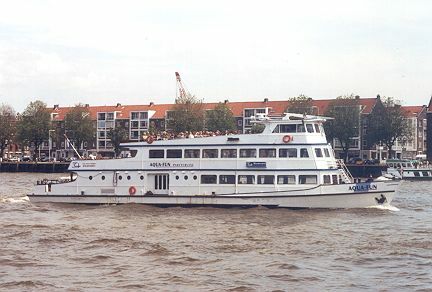 1974 - Sold to Ministerie van CRM (ministry of culture, sport and welfare), rebuilt as a floating boarding-house, renamed "Hollands Glorie" in the Wantij, Dordrecht. At this moment she is still in the same spot, bearing the same name. 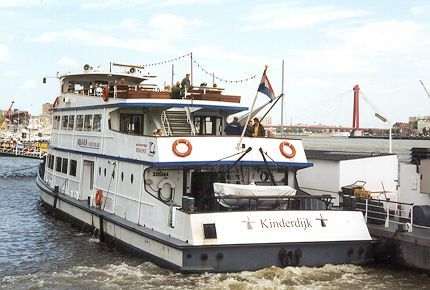 W.F.van der Wyck as built for service between Enkhuizen and Stavoren. This is an official card issued by the ship's restaurant. Euro Color postcard of Erasmus (serial number ecc1001). Kruger multi-view postcard of Erasmus (serial number 971/118). 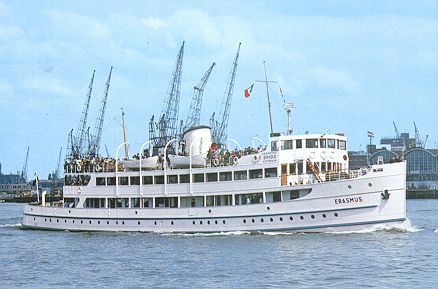 Euro Color postcard of Erasmus (serial number ecc935). 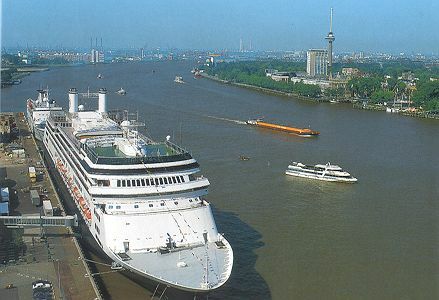 The liner in the centre of the picture is Anchor Line's Cilicia of 1938, used as a dockers training vessel in Rotterdam between 1966-80. 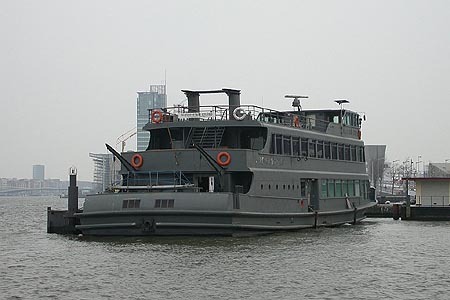 The former W.F.van der Wyck and Erasmus is now a stationary vessel in Dordrecht, with her engines removed. 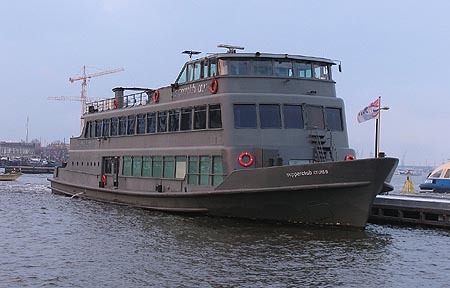 She is permanently moored in the "Wanty", near the Oranjelaan. 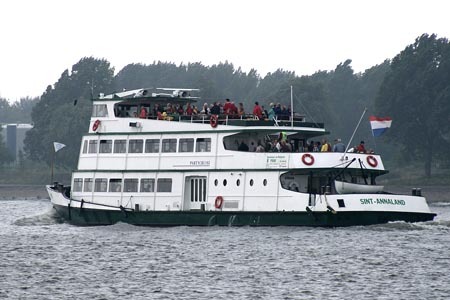 The other ships of the ferry-service between Enkhuizen and Stavoren both remain. 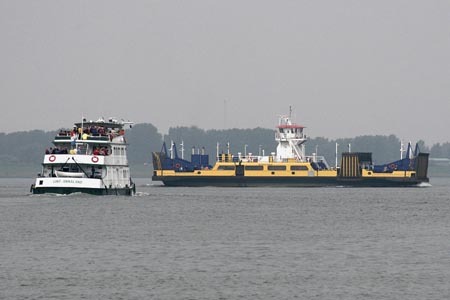 Van Hasselt is now active as Flandria 20 out of Antwerp, and C.Bosman is a stationary ship anchored in the Coolhaven in Rotterdam as a training vessel. Information and photo below supplied by W.Kruit. 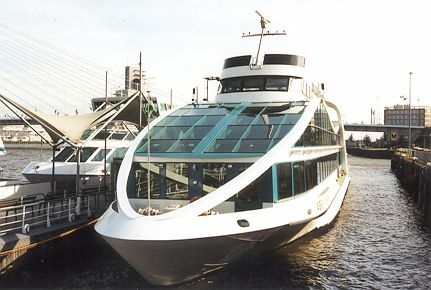 This is a photograph of Erasmus as she looks in 2002. 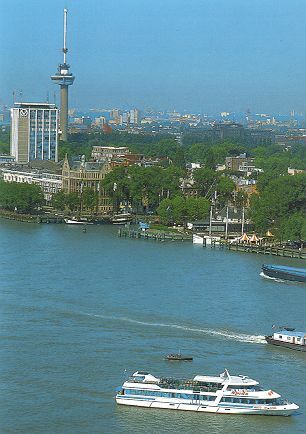 An early postcard of Prinsesseplaat. 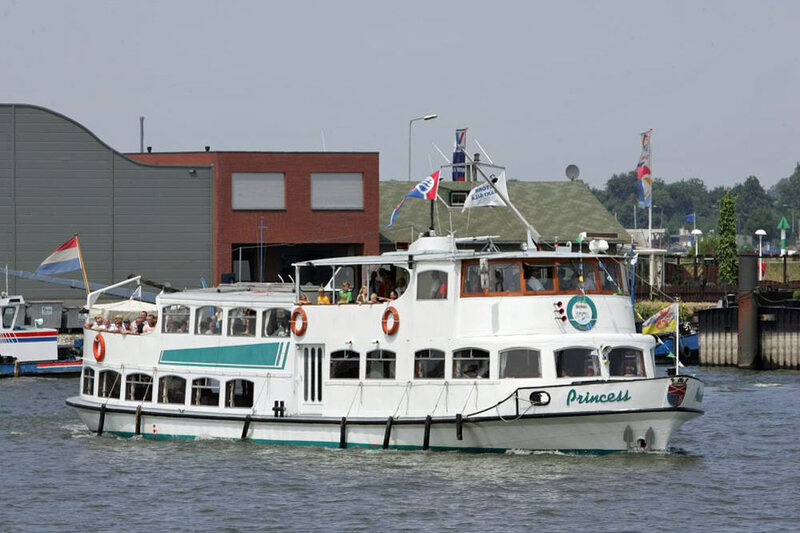 Euro Color postcard of Prinsesseplaat (serial number SP5). 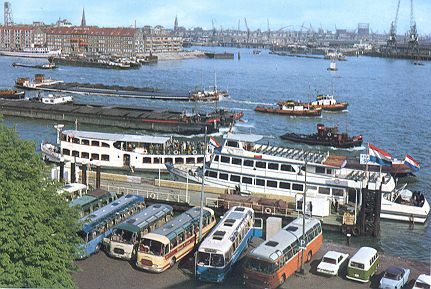 This card of Regentesseplaat dates from 1952, but I do not have other details yet. 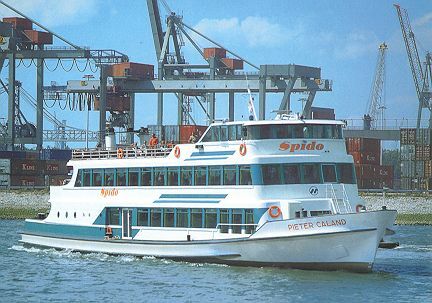 For many years the largest vessel in the Spido fleet, Pieter Caland was built in 1960. She was 50.9metres long and carried 525 passengers. 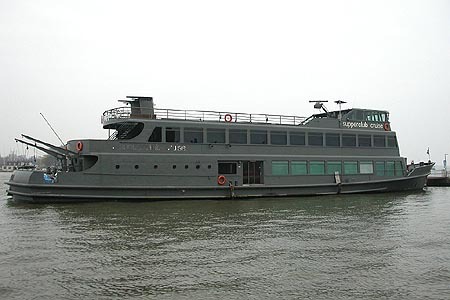 She left the fleet in 1999. 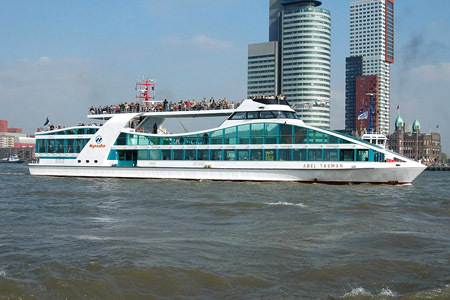 In 2005, the ex-Pieter Caland was operating as Supperclub Cruise in Amsterdam. Kruger postcard of Pieter Caland (serial number 971/100). Spanjersberg postcard of Pieter Caland (no serial number). 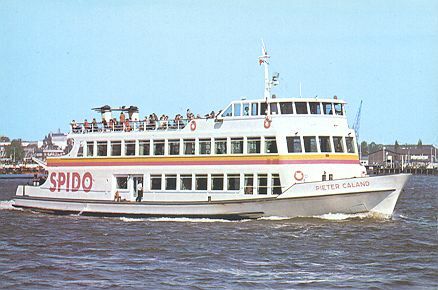 Euro Color postcard of Pieter Caland (serial number ec1005). Euro Color postcard of Pieter Caland (serial number SP1). 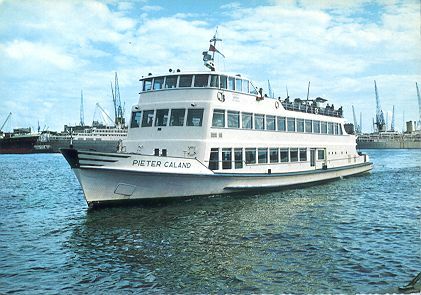 Euro Color postcard of Pieter Caland (serial number SP7). Bert van Los postcard of Pieter Caland (serial number RT61). 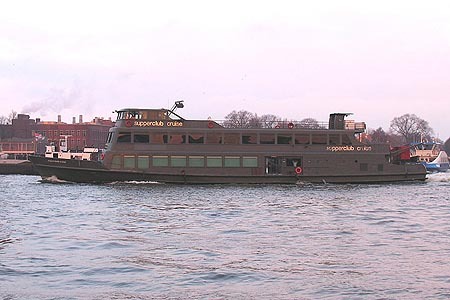 The ex-Pieter Caland operating as Supperclub Cruise in Amsterdam in 2005. Photo: &COPY; W.Kruit, December 2005. 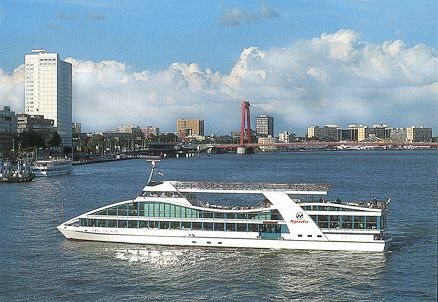 Supperclub Cruise (ex-Pieter Caland) in Amsterdam with Celebrity Cruises' Millennium. Prinseplaat was built in 1961, was 37.7metres long and carried 440 passengers. 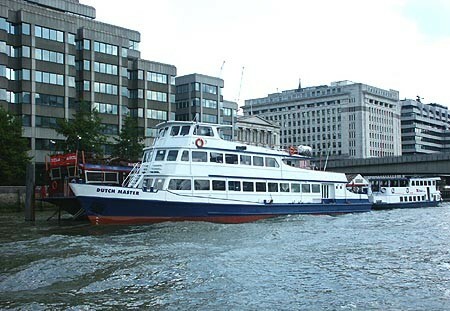 She left the fleet in 1999, and was bought by Thames Leisure of London for charter work, and was renamed Dutch Master. 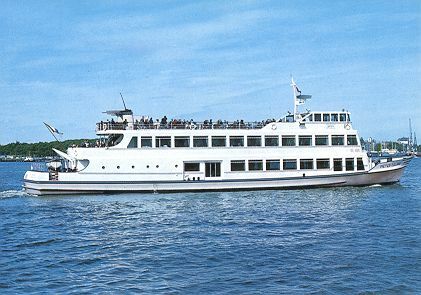 Euro Color postcard of Prinseplaat (serial number ecc914). 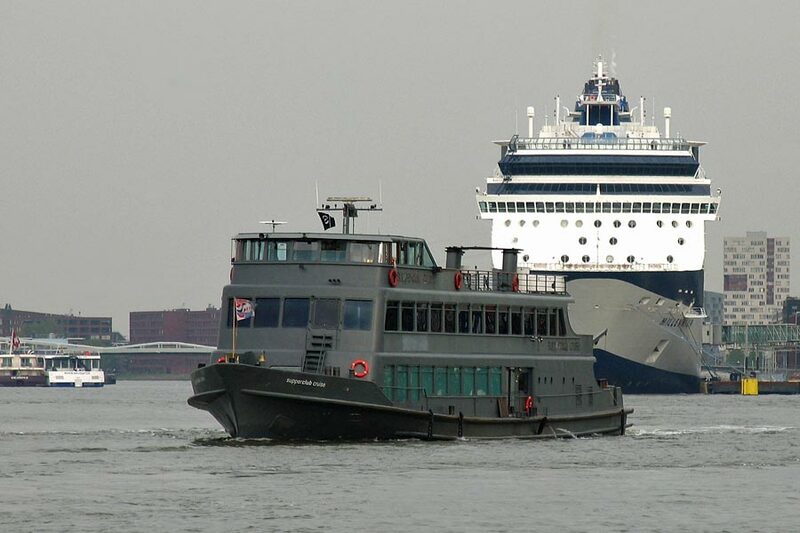 I have not identified the smaller vessel behind her. Euro Color postcard of Prinseplaat (serial number SP3 - same as card below!). Euro Color postcard of Prinseplaat (serial number SP3 - same as card above!). 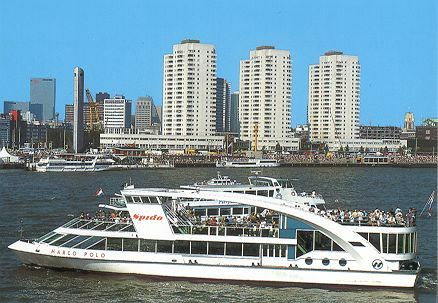 Euro Color postcard of Prinseplaat (serial number SP2). 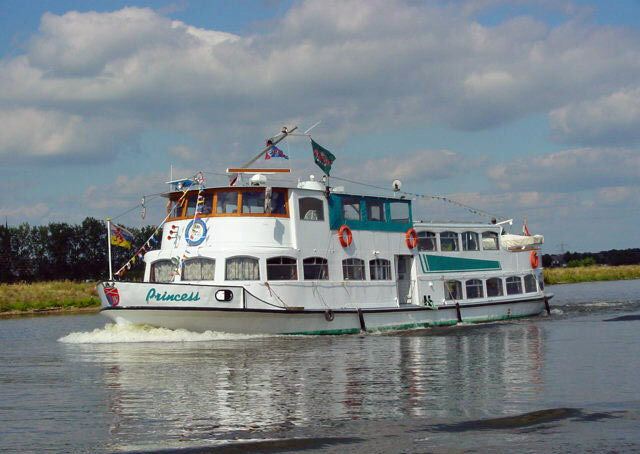 Dutch Master (ex-Prinseplaat), taken on the River Thames by Blackfriers Bridge. More photos are available on the Thames Leisure page. 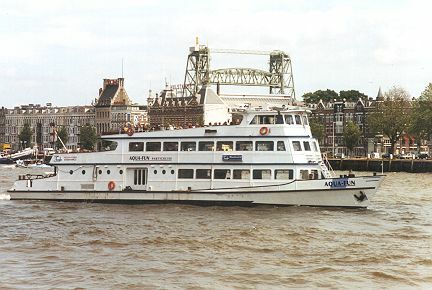 Stad Rotterdam was built in 1962, was 39.8 metres long and carried 305 passengers. 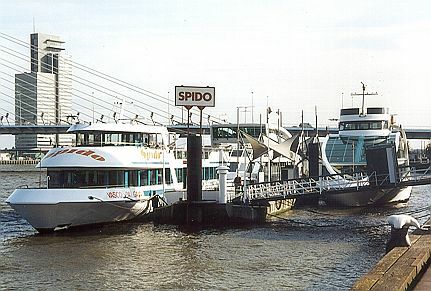 She left the fleet in 1999, but was chartered back to Spido in May 2001. 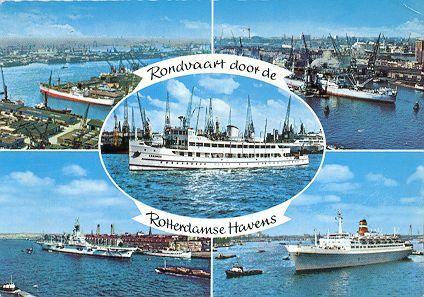 Spanjersberg postcard of Stad Rotterdam (no serial number). 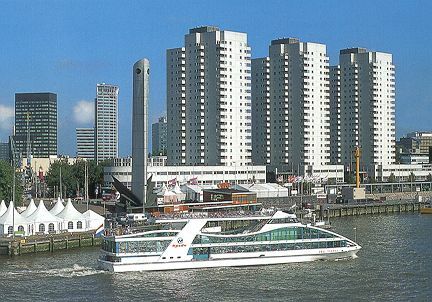 Euro Color postcard of Stad Rotterdam (serial number ecc1002). 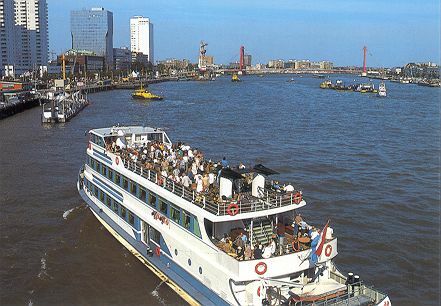 Euro Color postcard of Stad Rotterdam (serial number SP4). 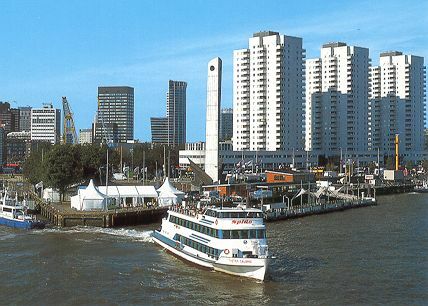 Paper Mill postcard of Stad Rotterdam in Holland International colours (serial number 414/H). 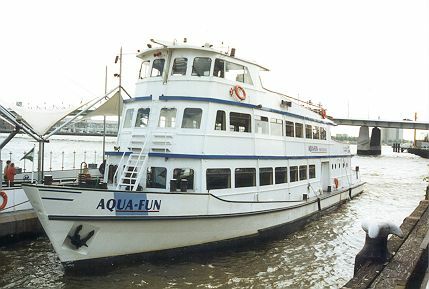 Stad Rotterdam still operates as the Aqua-Fun, and was chartered back to Spido for harbour tours in May 2001. 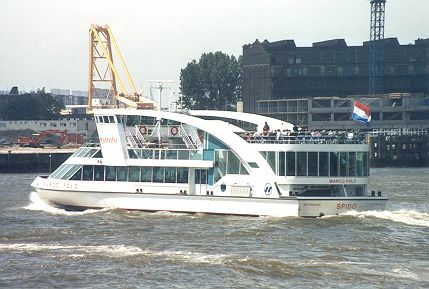 Oranjeplaat was built in 1966, was 40.1 metres long and carried 500 passengers. 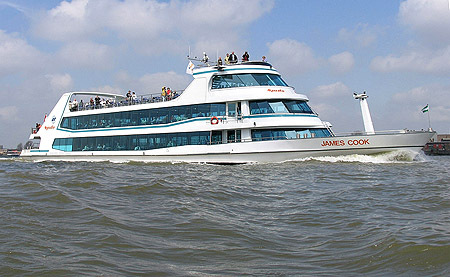 She left the fleet in 1998. In 2007 she was working for V-Zit in Antwerpen as Festina Lente. 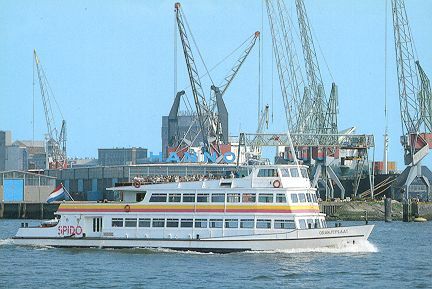 Euro Color postcard of Oranjeplaat (serial number ecc925). 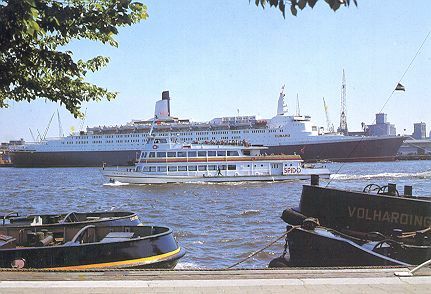 Euro Color postcard of Oranjeplaat (serial number ecc1006), passing Queen Elizabeth 2. 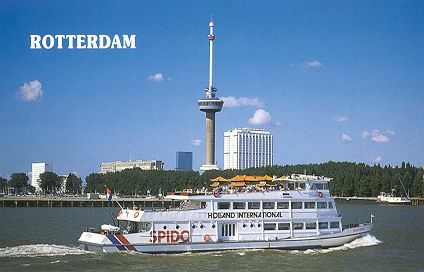 Euro Color postcard of Oranjeplaat (serial number SP3). Marco Polo was built in 1995, the first of three striking new vessels which have replaced the traditional fleet. 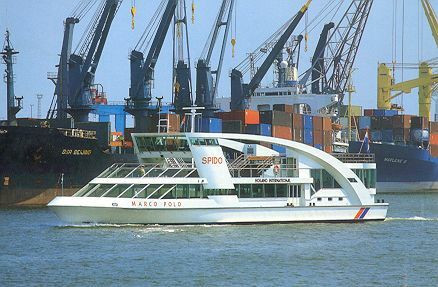 The Marco Polo has a length of 43.75 metres, a width of 8.6 metres and is equipped with a 2 x 320 PS Diesel engines. 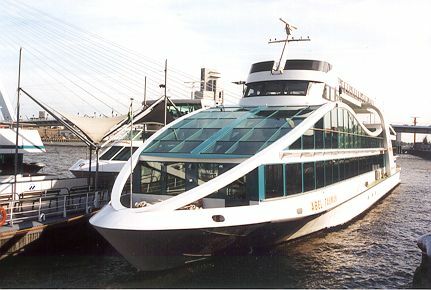 The capacity of the ship is 500 passengers. 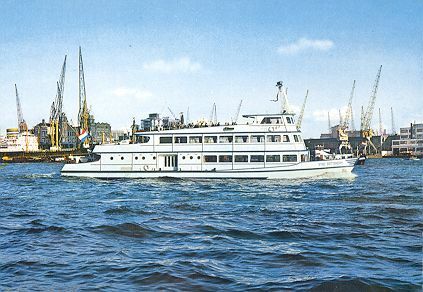 Euro Color postcard of Marco Polo (serial number SP5). 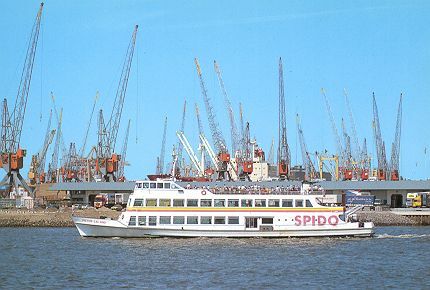 Bert van Loo postcard of Marco Polo, with the Spido terminal in the background (serial number RT62). 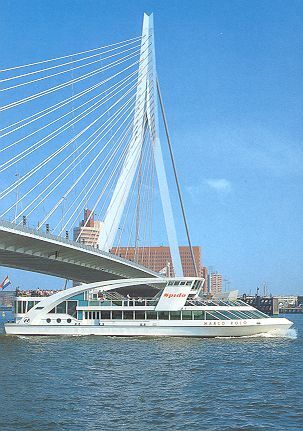 Euro Color postcard of Marco Polo, passing under the Erasmus Bridge (serial number SP6). 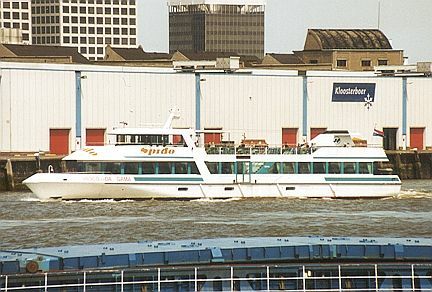 The following photographs of Marco Polo were taken in May 2001 by Ian Boyle. 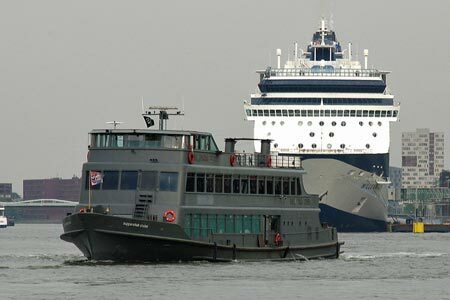 Vasco da Gama was built in 1998, the second of three striking new vessels which have replaced the traditional fleet. The Vasco da Gama is 40.20 metres long, has a width of 7.80 metres and is equipped with 2 x 320 PS Diesel engines. 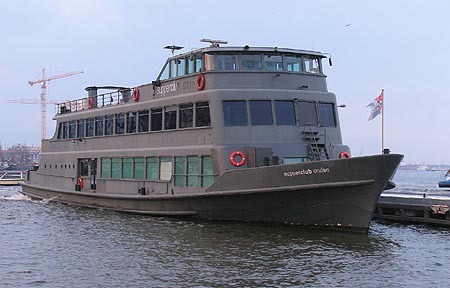 The ship has a capacity of 400 passengers. 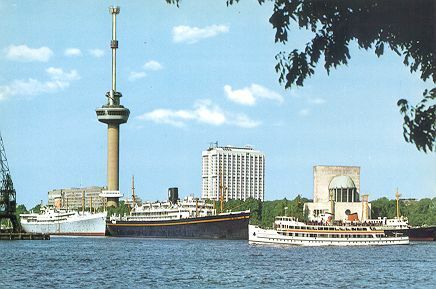 Bert van Loo postcard of Vasco da Gama, with the Euromast in the background (serial number RT54). 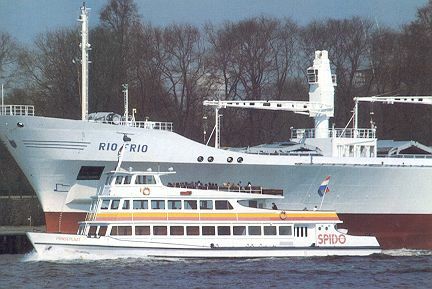 Bert van Loo postcard of Vasco da Gama, with the Spido terminal and the Pieter Caland in the background (serial number RT51). 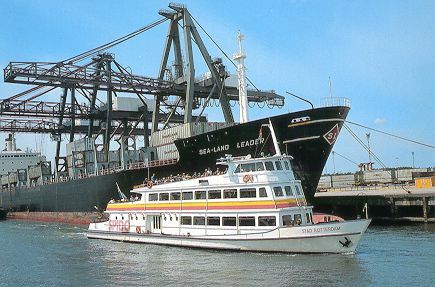 Bert van Loo postcard of Holland America Line's Rotterdam (6), with Vasco da Gama passing (serial number RT53). 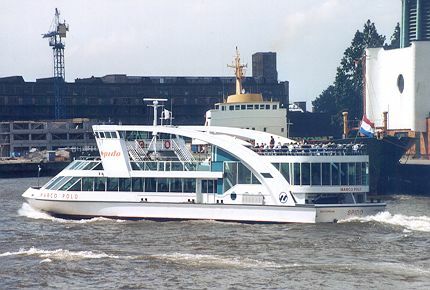 The following photographs of Vasco da Gama were taken in May 2001 by Ian Boyle. 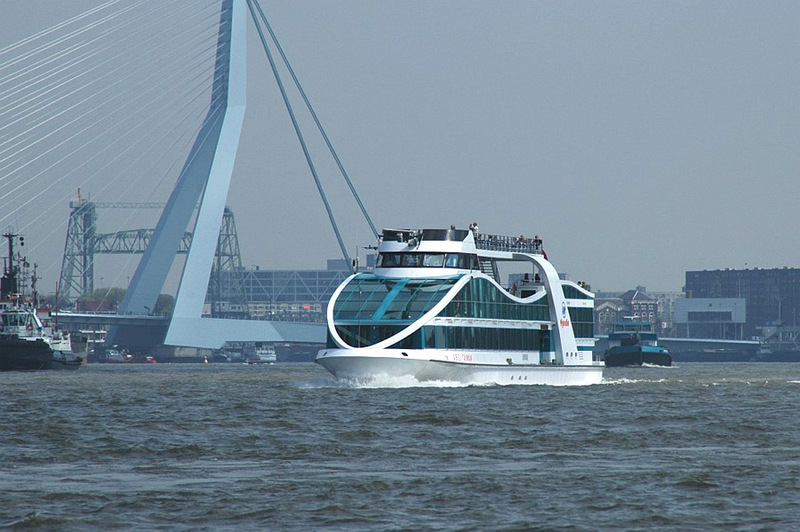 The Abel Tasman is the newest, futuristic ship in the Spido fleet, and is named after the Dutch explorer. 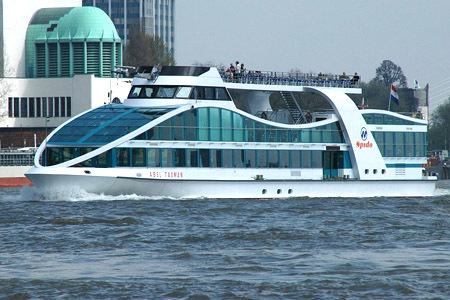 This ship has a length of 54 metres and is extremely open, due to the use of lots of glass and the open "sky deck". 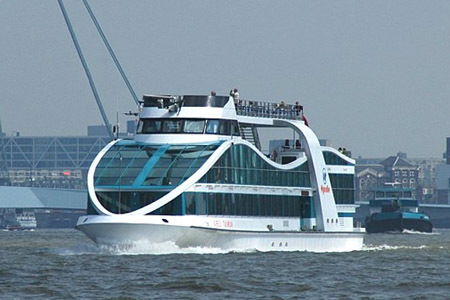 This ship has a capacity of 600 passengers: 320 passengers in the two inner lounges and 280 passengers on the upper deck. 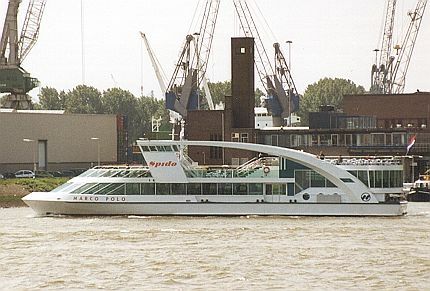 The Abel Tasman was delivered in July 2000, was designed by Fred van den Berg Design from Ede, and was be built in the Lobith shipyard, like the other ships Marco Polo and the Vasco da Gama. 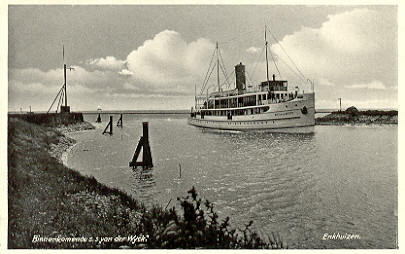 Bert van Loo postcard of Abel Tasman, with the Spido terminal in the left background (serial number RT89). 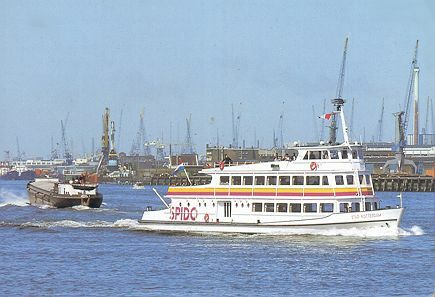 Bert van Loo postcard of Abel Tasman, with the Spido terminal in the background (serial number RT90). The following photographs of Abel Tasman were taken in May 2001 by Ian Boyle.